The attack on Fort Cooper was "headed by four or five chiefs, who were distinguished by their white plumes, and their movements in directing and inspiring their men." Myer M. Cohen, NOTICES OF FLORIDA AND THE CAMPAIGNS, 1836, quoted in Elwell, 1988. "(Osceola) wore three ostrich feathers in his head and a turban made of a vari-colored cotton shawl..." George Catlin, quoted by Goggin, 1955. The reenactor has the challenge of finding silk or wool scarves in Florida to make an older style turban. Silk is usually too costly and modern rayon is inappropriate. Any wool Scotch plaid muffler or scarf is fine, or any floral or paisley print. Plain solids are actually less common. The reenactor has a lot of freedom of choice here. If you don't have friends or relatives up North to locate one for you, and you aren't lucky at garage sales or flea markets, you can get wool plaid scarves from mail order places that cater to people who make outfits for Scottish games. Plaid and paisley wool cloth is in better fabric stores for S30 to $50 a yard, and sometimes on sale. Go in together with some friends, buy two yards, cut the piece into thirds lengthwise, and you have the equivalent to 3 wool scarves at about the same price each. A reenactor can also make a suitable turban with large paisley or floral print cotton handkerchiefs, even though this kind is more likely to fit into the late 19th century. For dress up occasions (and what reenactment is not a dressy occasion), the turban needs to get the extra touches. The most obvious is ostrich plumes, the Seminole feather of choice. Creeks occasionally wore eagle or some other fancy feather, but there is as yet no documentation for any feather other than ostrich or crane for early 19th century Seminoles. They didn't start wearing egret plumes until later, when they were living down in the Everglades. Finding those ostrich plumes is another challenge for the hobbyist. Friends have reported finding fat fluffy plumes in theatrical and costume shops (Orlando), a magic store (Sarasota), window dressing suppliers (Winter Park), and wedding boutiques (Miami). They have been reported in places like Pier One Imports and in flea markets. 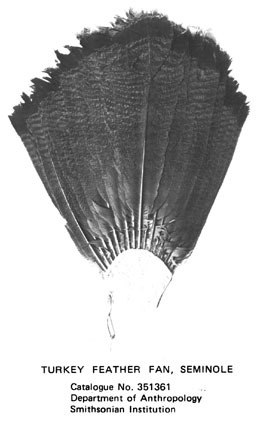 Ostrich feathers come dyed in many colors, but perhaps not every color is appropriate for the 19th century. The lS20's Seminole pictures in McKenney-Hall show a total of about 20 plumes. One of Osceola's three is white, and Yahahajo's single one is red. The other eighteen are all black. Eight ostrich plumes are among the Creek portraits; one is white (dyed red at the tip), two are red, and the other five are black. The portrait by Curtis and Catlin's two portraits of Osceola confirm his use of-one white and two black feathers. In his other Seminole portraits, Catlin shows us Mick-E-No-Pah (two white feathers), Lah-Shee (one small white one), Ye-How-Lo-Gee (one small blue one), and Co-Ee-He-Jo (two black ones). The photographs and lithographs of Billy Bowlegs show him wearing two to five plumes, always black. Only Billy Bowlegs seems to ever wear more than three at a time. This seems to be a number large enough to be a pretty good sampling. Black is obviously a big favorite, much more than white (which was unexpected by the author). There are a couple of red ones and a small dark blue one, but there is no support for yellow, green, orange, light blue, or purple. By the way, if your ostrich plumes ever get caught in the rain, don't panic even though they will look terrible, not unlike a drowned rat. Hang them up to dry and they will fluff out again. Maybe not as good as new, but not a total loss, either. It appears that some reenactors are a little vague on what goes on the outside of the cloth turban. Some turbans have so many pins on them that they look like early 19th century equivalents of baseball caps. While those reenactors may have had fun assembling those pins, and do look impressive wearing all of them, there is not much to indicate that Seminoles actually followed that fashion. Seminoles did not pin anything at all on their turbans until after about the 1880's, when triangular beaded pendants started to appear. Even then, the pendants are seen only infrequently in period photographs, although many museums now display examples (Smithsonian; American Museum of Natural History, New York; Milwaukee Public Museum; Historical Assoc. of Martin County, Stuart, FL). A reenactor who wanted to dress up his turban would do much better to add a headband. These were made in German silver alloy or, rarely, real silver. A headband made out of real silver back then would have been quite an affluent flashy accessory, probably something like a Rolex watch today. A much more economical German silver headband is a very nice added touch to any outfit, then or now. Not every turban had one. Osceola didn't wear one. Of the ten McKenney-Hall pictures of Seminoles, all wear turbans, but only four have headbands, varying from two to three fingers wide. 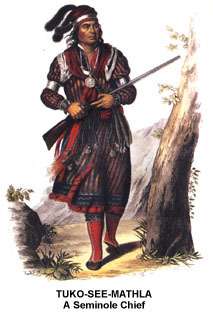 Catlin painted six Seminole men, only one of which has a headband. The highest proportion is in an 1853 print of "'Billy Bowlegs,' and His Suite of Indian Chiefs," in which four o£ six Seminoles are wearing headbands. There are also a couple shown among the Creeks in McKenney-Hall. These have the same kind of rounded crenellations that are on most (but not all) of the Seminole headbands. Among the Seminoles, Tukosee Mathla's appears to be unique in that it has pierced designs. Yahahajo's is not crenellated and is undecorated except for incised lines inside the edges, similar to those on gorgets, as is the one shown in Catlin's painting of Lah-shee. The one in Billy Bowleq's photograph has large crenellations, but there doesn't appear to be any incised ornamentation or lines at all. 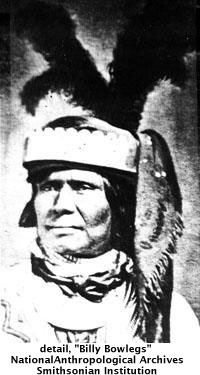 Headbands were popular with the Seminoles. for a long time. They were still worn well past 1900, sometimes even along with beaded pendants. These later headbands tended to be slightly narrower and have very small crenellations, if any at all. Like many other parts of an old-style Seminole outfit, headbands aren't complicated pieces to make. German silver is available from Indian hobbyist catalogs, and can occasionally be found in local lapidary stores. It's a simple way to add A lot of flair to your outfit. 1896 Preface to Second Edition (and) The Seminole Indians, HUNTING AND FISHING IN FLORIDA. 1988 "Georgia Mllltia at Fort Cooper In the Second Seminole War." The Rebel Sabretache, XIV: 5, Sept.-Oct. Atlanta Soldier Society. 1955 "Osceola: Portraits, Features, and Dress," The Florida Historical Quarterly, XXXIIJ: 3 & 9, Gainesville. 1967 HISTORY OF THE SECOND SEMINOLE WAR 1835-1842. University of Florida Press, Gainesville. 1914 edition, THE SEMINOLES OF FLORIDA, Moffat, Yard and Company, New York. 1967 "Billy Bowlegs (Holata Micco) in the Seminole Wars." Florida Historical Quarterly 45:219-42.